Years after In Cold Blood, the same town would play host to another graphic murder. Olathe, Kansas—the same town that played host to the quadruple murder made famous by Truman Capote’s In Cold Blood—achieved notoriety again in 1982, when a gentle man named David Harmon was bludgeoned to death while sleeping. David’s wife Melinda and best friend Mark were suspected of the brutal murder. But rather than receiving a just penalty, Melinda and Mark walked away without charges being pressed, thanks to a defense by the growing Christian evangelical church in Olathe to which the victim and the suspects all belonged. Two decades later, two Olathe police officers revived the cold case, making startling revelations that followed the old suspects to their new, separate lives. Melinda lived in suburban Ohio, a devoted wife and mother of two. Mark had become a Harvard MBA, a high-paid corporate mover, a family man, and a respected community member in a wealthy suburb of New York City. But some twenty years after the brutal murder, justice would be served. 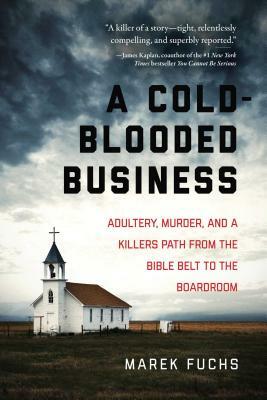 Featuring a new afterword from the author, A Cold-Blooded Businessis a chilling exploration into the darkest depths of the human psyche. Marek Fuchs is a teacher, journalist, and volunteer firefighter. After six years as a stockbroker, he became a journalist, in which role he has written columns for the New York Times, the Wall Street Journal, Yahoo Finance, and TheStreet. Fuchs speaks regularly on business and journalism issues, and currently serves as a member of the writing faculty at Sarah Lawrence College. He lives in a loud house with three children in Hastings-on-Hudson, New York.